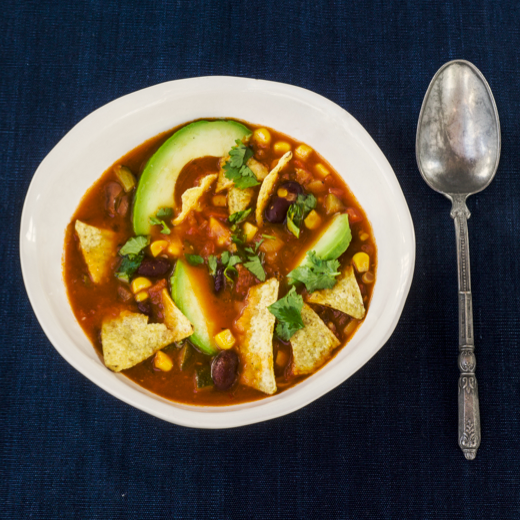 If you're after something a little different then why not try this tortilla soup. Sound strange? Well it's packed full of flavour and and spices to create this hearty broth with a crunch. This recipe comes courtesy of Whole Food Heaven, a husband and wife team dedicated to providing the best vegan and vegetarian food around. You can easily find them at any market in their converted Citron H Van, just follow the smell of delicious food. The origins of this popular Mexican soup are a bit of a mystery and there are countless variations. people argue ferociously over which version is correct (and best! ), but no matter which one you pick you’ll enjoy a pungent, deeply comforting mix of heady flavours. It’s usually topped with tortillas that are sliced and then toasted, and this adds an unusual toasted-corn element, but you can substitute the tortillas for tortilla chips if you want to save time. In place of soured cream, we’ve used avocado – a vegan’s best friend – for its easy, creamy goodness. In a large pan, sauté the onion in the olive oil until translucent. Add the garlic, peppers, courgette, sweetcorn kernels, red chilli, chipotle and spring onion. Season with the cumin, paprika, salt and white pepper and stir well. Cook over a low heat for about 10 minutes, then add the chopped tomatoes and the vegetable stock and bring to the boil. Reduce the heat slightly, partially cover and simmer for a further 25–30 minutes. Meanwhile, prepare the sliced corn tortillas, if using. Preheat the oven to 180 ̊C/350 ̊F/gas mark 4. Coat the tortilla strips with a little olive oil and arrange them in a single layer on a baking tray. Toast in the oven for about 5 minutes, or until nice and crisp. Set aside. Add the beans to the soup and cook for another 10 minutes until heated through. Check the seasoning and adjust to taste. Divide the soup into bowls and serve topped with coriander, avocado, toasted tortilla strips or chips and a squeeze of lime juice.